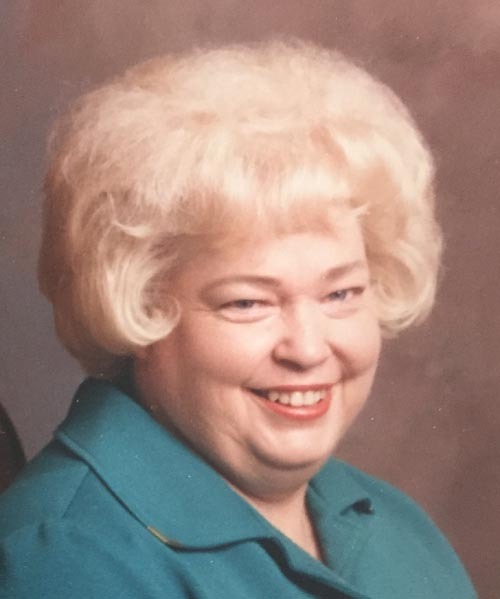 Georgelen “Georgia” Mahon, age 82, of Aurora, passed away on Friday, August 24, 2018, at Westfield Quality Care in Aurora. Funeral Services will be held at 10:30 A.M., Tuesday, August 28th at the First Christian Church in Aurora. Rev. Bruce Bradley will officiate. Interment will be in the Grand Island City Cemetery at 1:30 P.M. Visitation will be from 5 - 7 P.M. Monday at Higby-McQuiston Mortuary. Memorials may be made to the family to be designated at a later date. Condolences may be e-mailed to the family through the mortuary website at www.higbymortuary.com. Georgia Ann Mahon, the daughter of George and Helen (Zimmerman) Bense was born on November 12, 1935 in Falls City, Nebraska and passed away on August 24, 2018 at the age of 82. She grew up in Falls City and Grand Island and graduated from Grand Island Senior High School in 1953. Georgia was united in marriage to Alden Jensen and four children were born to this marriage. Georgia was united in marriage to John Mahon on November 4, 1964. Georgia lived in many different states including Wyoming, Colorado, North Carolina, Illinois and Nebraska. She worked for IBM for many years. After her retirement they moved to Aurora, NE. John and Georgia enjoyed going to Texas during the winter months. She was preceded in death by her parents, brother, Roderick Bense and sister, Judy Puga, step-son, Timothy Mahon and two granddaughters, Erika and Nevaeh. Those left to cherish her memory are her husband, John of Aurora; daughters, Linda Ambrose of Yutan and Cindy Montgomery of Grand Island, Tara (Frank) Gregoski of Kearney; son, Nick (Sue) Jensen of Garland; step-children, John S. (Rennie) Mahon, of Arkansas, Debra (Bob) Desch of Denver, CO; 18 grandchildren and many great-grandchildren and great-great grandchildren. She is also survived by sister Jean (Larry) VanBibber of Aurora and numerous nieces and nephews.